How fast are Internet connections across the world? How fast are they in your country? This article examines the real-world connection speeds for people in the top 50 countries on the Internet, i.e. the countries with the most Internet users. This list of countries ranges from China at number 1 with 420 million Internet users, and Denmark at number 50 with 4.75 million Internet users. We’ve included this ranking within parenthesis next to each country in the charts below for those who want to know. These 50 countries together have more than 1.8 billion Internet users. As an Internet user, you can get an idea of how your own Internet connection speed holds up against others in your country. As a Web service provider or website owner, you get an idea of what kind of Internet connection speeds your customers are likely to have in different countries. This is highly relevant if you want them to have a positive user experience. This naturally applies to web developers in general as well, who should be well aware of the capacity of people’s Internet connections. Thanks to data directly from the world’s largest CDN provider, Akamai, we were able to create this report for you. Real connection speeds for Internet users from all over the world. The data is from the second quarter of 2010, so it’s up to date. Before we go on to see how each country’s connection speeds are distributed, let’s look at the average connection speed for each country. As we mentioned before, the number you see within parenthesis next to each country is its worldwide rank in terms of Internet users, i.e. its size on the Internet. The chart is sorted by the average connection speed. South Korea, as is well known, is something of an Internet speed king, and that’s made abundantly clear in this chart. At an average connection speed of almost 17 Mbit/s it thoroughly outclasses the competition. China, although the largest country on the Internet, still lags behind when it comes to Internet connection speeds. Its average of 0.86 Mbit/s is far below the world average of 1.8 Mbit/s (see below). And speaking of China, Hong Kong, technically a part of China but separated in most surveys for statistical purposes, is clearly far ahead of its mother country. With Hong Kong’s average connection speed of 8.6 Mbit/s, it’s second only to South Korea. It’s also interesting that all three top positions are in Asia. Of the top 10 in this “speed list,” three are from Asia, and seven from Europe. Canada beats the United States, barely, with 4.7 Mbit/s versus 4.6 Mbit/s. 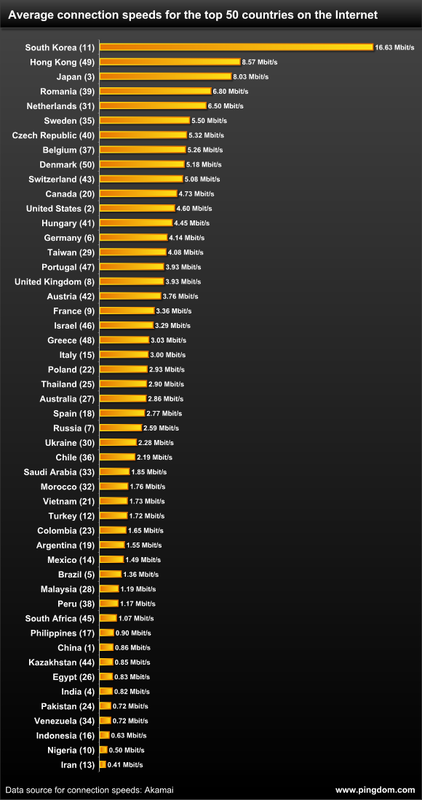 The average connection speed for Internet users worldwide, not just among these 50 countries, but all countries, is an average of 1.8 Mbit/s. As an average, this is actually pretty good, but as you’ve seen, there are plenty of extremes in either direction. And here’s how the various connection speeds are distributed. Once again, this is not among these 50 countries, this is for the world seen as a whole (from Akamai’s perspective). It’s quite encouraging that as many as 22% of the connections are 5 Mbit/s or faster, and even more that more than half of all connections are 2 Mbit/s or faster. Now on to the prettiest of these charts… What you see here below is how the connection speeds of each country are distributed, just as in the worldwide chart. It’s great for giving you a good overview of the situation in each country, since an overall average can only tell you so much. The country list is sorted by average connection speed. As this chart shows, the slowest connection types (less than 256 kbit/s) have almost been eradicated in many countries. However, in many developing nations these still make up a significant portion of the connections. The speeds in this article are actual connection speeds. We’re not showing what people are paying for, we’re showing what kind of real-world speeds they are actually getting. After all, we all know that ISPs don’t always deliver the kind of connection speeds that they promise in their ads. 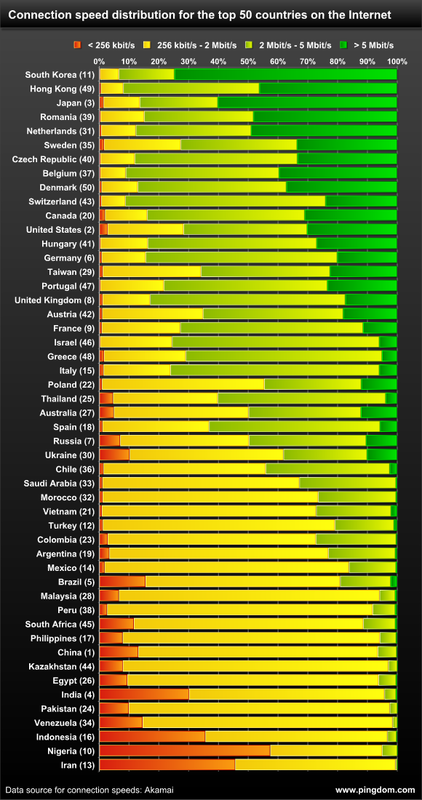 So now that you have this report in front of you, why not take a close look at how fast the Internet is in your country? And how does your own connection measure up? Data sources: Akamai for connection speeds, Internet World Stats for Internet user numbers. We’ll be doing at least one more post based on the data we got from Akamai, so keep your eyes open. This isn’t actually “speed” though, is it? It’s bandwidth. Google’s Mike Belshe released data this year showing that network latency rather than bandwidth had a greater affect on the speed of browsing. I’d be very interested to see how each country lines up in terms of network latency, both in country (to popular sites) but also to the rest of the world. None of the analysis matters unless you provide the exact way in which the bandwidth was actually measured. I 100% agree with Tom. These numbers are really only relevant to people who are downloading / steaming content (of any type/form). The REAL connection measurement for Internet users is latency. It doesn’t matter if I have a 17mbps connection in Korea (which I have had the pleasure of experiencing there), if everything is 1000ms or more of latency away it will still be a poor user experience. I’m not saying that is the case, I’m just saying those are the numbers I’d be most interested in seeing. Echoing the comments of Tom and Jeremy, I’d like to ask for a bit of clarification. What exactly do these measurements measure? Are you talking about available theoretical bandwidth based on capacity or on actual data transmission time from a source to a consumer? @Nicholas and anyone else who asked about what is measured. Considering Akamai is a CDN provider, you can rest pretty assured that these numbers are based on actual data transmissions from Akamai’s edge servers to consumers. Does anyone know if this data includes phones? Like would it recorded the speed of a connection if I went to a web site on my phone. If so, I think that would effect USA a great deal. Interesting graph, but I hope you could publish a similar insight for The top 50 internet-using countries (highest penetration). It should make for some interesting comparative perspectives. You could have a third showing speed/Facebook penetration. I agree with Tom and Jeremy. Latency is what you should really look at. I currently live in Australia where I have a 8Mbit ADSL line with 600ms latency to the main websites. Well, my browsing experience is far worse than I had in Morocco with 2Mbit ADSL line and 150ms latency. So while this chart is informative, it’s also quite deceptive because unless we’re solely discussing video streaming, it doesn’t reflect the quality of the user experience at all. Very very incorrect data !!!!!!! I’m living in Hong Kong and has 100Mbps broadband. Download files from Akamai CDN around 88Mbps. But it is only the local speed. Connection outside Hong Kong are much slower. Hong Kong may hit No.1 in next few years I guess. ISPs, include the large market share ISP in Hong Kong, promote 100Mbps now. Monthly fee in Hong Kong only around USD25, most people will upgrade to faster network in their next contract. So this shows download speeds; after all, it’s Akamai data. I’m as interested in upload speeds. Services like Skype, YouTube and Flickr depend on users to send large files and streams. Skype and Microsoft work with 720p HD webcams, but you need about 1 MB up to send. As the webcams and mobile phone video cameras swing to higher resolutions, the distribution of the ability to send is as important as the ability to receive. Akamai is unlikely to have real world upstream data. Who would? @KristoferA – In Thailand, the problem is with international bandwidth, not the local connection. At the office I have a 10Mbps connection, but internationally I am lucky if I get 1Mbps. At home it’s the same, my 8Mbps connection is again lucky to reach 1Mbps internationally. Akamai has a lot of servers in Thailand, as do several other CDNs, which is why downloading from Apple, Microsoft, Adobe and other large sites often gives you full speed (as they’re using CDNs). So I think that there’s nothing wrong with this article. In Thailand, international bandwidth is the problem. moldova’s internet speed has from 5-20 mb/s. Where is result from Moldova? Скорость/througput, представленные на Диаграмме с Akamai data – нужная инфо и для обычных users! 5) Ежемесячная плата около USD35. Speed / througput, presented in the chart with Akamai data – info needed for normal users! Why you listed this graphs without Republic of Moldova? As far as I can see from above comments most (if not all) of ISPs are cheating their customers with connection speed. Cyprus is not mentioned here. But I have private (ADSL 0.5/5Mbps up/down) and business (ADSL 0.2/2Mbps up/down) connections but I could measure contract values only after midnight and till early morning and during daytime download speed I often get only 10-20% of contract values. This happens mostly not because of poor equipment used but simply providers are quite lazy to organize proper traffic shaping and they allow a few % of customers to grab all bandwidth of overseas channels. South Korea is Excellent, Best Korea Total Network Company is KT!! @Janis and Latvia: We chose to limit this to the 50 countries with the most Internet users, or else the charts would have become way too large and difficult to read. Yes, there are many more countries, but these 50 countries make up more than 90% of the Internet population. Owns this noob list, which ignores 145 other world countries. Very interesting indeed. I live in the Philippines, and I am saddened to say that until now we don’t have decent internet lines in our area. Where is result from Belarus? Do not worry. Kazakhstan is a former soviet republic with comparatively developed infrastructure (telephone lines etc.) built in 60`s and 80`s. So it was easier for them to establish Inet connection. Besides, India is much bigger. And its more difficult to create infrastructure at once. Good luck! India is not much more than Kazakhstan. But with more than mastered. In Kazakhstan, a lot of empty spaces and the need to pull the cable through the desert terrain without any infrastructure. It is very expensive. Wow that is somewhat surprising that the US is so low on the list. We need to improve our infrastructure or something. I definitely thought we would be higher. You also need to consider location of the web server, because while it is relatively easy to increase bandwidth, decreasing latency is very expensive. Whow, we dutchies are doing fine! Would have expected more from China. Here in Brazil, the internet operators sell their fees as “10mb” or “5mb” but they only deliver 10% of that. I use a 10mb internet at home, but my download speeds reach a maximum os 1.1megabit/s is this common on other countries? Tip: Note if the “B” is a cap or not. The following paragraph is a little bit off topic but it is also informative if you think that your connection doesn’t deliver his better potential. There is many things that can reduce your connection speed: network congestion, line topology, server location. Downloading content from a foreign server is usually slower than from a local server because international bandwidth is expensive, many country cannot afford larges pipelines. The demand is growing faster than the prices get down. @Kacheron Well I am from Brazil too with home broadband connection (ADSL) for more than ten years and never had any speed issues whatsoever. I’ve had downstream links of 256, 512, 2000 and now 4000kbps. Nice article by the way. I wonder what the average price for the megabit is in each of these countries. Im in Korea and There is nothing different of browsing website. But download speed is well… maybe little different. With torrent client, i usually reach as 5mb/s and greatest speed was 11mb/s. In conclusion, Download speed is so great as you know, but web browsing is so so. Is Apple abandoning the server market forever, or...? If your mobile phone becomes your new wallet, what happens if the battery dies...?